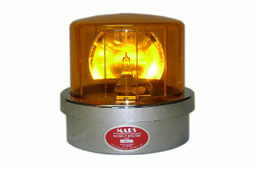 The Skybolt (SW) is a full sized, Rotating Beacon Light. Durable Mars gear drive for reliable operation. Excellent for indoor or outdoor signaling, safety, or warning applications. Dome colors available: Amber, Blue, Clear, or Red. 50 watt halogen bulb or dual 30 watt incandescent. 100 - 120 flashes per minute. Black or chromed plastic base. 4.5 amps at 12 VDC. 7 1/2" high, 8" diameter, Shipping Weight, 4 lbs.